"It's often said that a leopard cannot change its spots, but is the new Leopard operating system helping Apple change the PC industry? "Two recent ChangeWave surveys provide new insight on Leopard's industry impact, along with a close look at consumer and corporate PC demand for 1st Quarter 2008. "Apple computer sales continue to show extraordinary momentum for the holidays, according to our latest PC buying survey of 3,872 consumers (Oct 29 - Nov 5). "Tellingly, one-in-four respondents (24%) say that the release of Apple's new Leopard operating system has made them more likely to buy a Mac in the future." "Apple's latest keyboard is the sleek aluminum number shown here. While this is a beautiful keyboard and will no doubt win some design awards, I was underwhelmed when I tried one at the Apple Store. I prefer a keyboard with a bit of feedback - a 'click' that I can feel as I press each key. Maybe even a noise. While Apple's new keyboard looks great and works fine, it provides no feedback at all, and I was unable to accurately touch-type. "Searching every local computer store for a keyboard that looked and worked as good as my old Apple keyboard, I found one that is 95% of the way there. The Kensington Slimtype is a nice low-profile keyboard that still has a satisfying click to its keystrokes. It's available both in a PC version and in the white Mac-style version. "I highly recommend the Kensington SlimType, which seems hard to beat for $30 and is available just about everywhere." "There is a hidden solution...."
"Western Digital's 1 TB My Book World Edition external hard drive has been crippled by DRM for your safety. "A kindly Reg reader tipped us off that the remote-access HDD won't share media files over network connections. Which is, as you can see here, the entire stinking point of it. "It's a scary world full of potentially unlicensed media. We're fortunate there's a hard drive vendor willing to step forward and do some indiscriminate policing for us. "You have 20 seconds to comply...."
"Concerned about piracy of multimedia files, Western Digital has disallowed the sharing of multimedia files on its 1T-byte network-attached storage drive, the WD My Book World Edition. "Due to 'unverifiable media license authentication,' the remote desktop software embedded on the NAS device does not share audio and video files, including MP3, MPEG, AVI and DivX files, according to WD's customer support site ." "Learn which versions of Mac OS X come with Intel-based Macs. Important: Do not use a Mac OS version earlier than the one included with the computer. "If you have a PowerPC-based Mac, see below." "Learn the version(s) of Mac OS included with PowerPC Macs produced since 01 Jan 1998. If you're looking for information about Intel Macs produced since 2006, see this article. "Some computers may include a slightly newer build (but same numbered version) of Mac OS X on the Install or Restore discs than was preinstalled on the hard drive. This is normal. "Some versions of computer-specific software can only be used for NetBoot or System Images for the computer model with which they were bundled. This includes these Power Mac G5 computer-specific builds: 6S74, 6S75, 6S80, 6S90." "With this new Missing Manual, you can count on learning how to use all of Leopard's new features including the Time Machine, Boot Camp, and File Stacks. And here, as a bonus, David gives you six of his favorite Leopard tips...."
PR: The TVMini2 from Miglia is now available from its online store, Apple Premium Resellers, and all good resellers Europe wide. In fact, purchasing a new iMac this Christmas could get you a TVMini2 for as little as €1/£1 (see miglia.com for details). The TVMini2 is a digital tuning device especially made for Mac users. The stylish ultra-slim design makes the TVMini2 the smallest and sexiest USB device available. It slots neatly into a USB 2.0 port, without blocking any other ports/outlets, including the MagSafe on your MacBook Pro. The TVMini2 can transfer your favourite TV shows onto your iPod®, PSP™ or Apple TV™ allowing you to set your own TV programme schedules. It's a great way to enjoy last night's show on the way to work! The TVMini2 is priced at £59.99 or €78.99. PR: Newer Technology, Inc. (NewerTech) has announced new lower pricing on its award-winning Guardian MAXimus, the first low-cost FireWire and USB2 External RAID 1 storage solution for consumers and professional users alike. Guardian MAXimus received a Five Star Rating in the December 2007 issue of Photoshop User magazine. "Easy to use, incredibly fast, and offers a lot of space for the price . . . the perfect space-to-speed ratio that's so important to graphics professionals, digital photographers, and designers," said PhotoShop User magazine. Introduced May 2007, Guardian MAXimus has also earned accolades from The Mac Observer, MyMac.com, and American Photo. Guardian MAXimus RAID-1 mirror storage solution is a Plug 'N Play "Live Activity" backup solution for creative professionals. Always guarding against data loss and costly system downtime, Guardian MAXimus writes the same information in real-time to two separate drives for a "mirrored" copy. 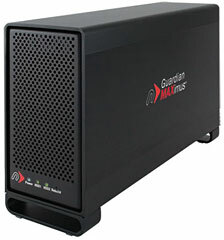 With up to 1.0TB dual SATA drives, data transfer rates up to 100MB/s, OS X "Leopard" Time Machine readiness, and FireWire 800/400 and USB 2.0 ports, Guardian MAXimus offers performance, flexibility, and reliability for critical data backup. Guardian MAXimus is available immediately from NewerTech's exclusive distributor, Other World Computing. Behzad Esghieh, CEO of MicroNet Technology said, "This is just a part of our ongoing commitment to the Mac community." MicroNet Technology, the first manufacturer of disk arrays for the Mac Platform, opened its doors in 1988. Today MicroNet remains a leader in storage technology for the Mac Platform, with customers working in graphic design, digital pre-press, audio and video professions. As part of the support for the OS, all of the above Fantom Drives and MicroNet USB, Firewire & eSATA drives are compatible with Time Machine, the exciting new backup suite coming with Mac OS X 10.5. Joe Trupiano, Director of Marketing for MicroNet Technology, spoke candidly on the subject of Time Machine, "Backup is the most important role of a storage product; there's no warranty in the world that will cover your memories." For customers looking for continuous backup functionality over the network Fantom Drives also offers the Award-winning NTI Shadow software, which allows real-time, continuous backup in addition to scheduled backup to virtually any storage device, and is fully compatible with Leopard as well. About MicroNet Technology and Fantom Drives Based in Torrance, California, MicroNet and Fantom Drives manufacture a full range of data storage solutions for a wide range of customers. From the affordable Titanium line of desktop products to high-performance RAID and NAS solutions. MicroNet and Fantom Drives continue to lead the industry in quality, performance and value. Their award-winning storage solutions include Titanium disk drives, SANcube FireWire Storage Area Networks, the miniMate and the Platinum family of personal storage. For product and reseller information, contact MicroNet Technology and Fantom Drives, at phone: 310-320-7272, fax: 310-328-0202, or on the Web. PR: On the eve of Release to Manufacturing (RTM), the Mac BU is giving you a final peek into the new Office 2008 for Mac before it officially launches at Macworld. This last sneak preview provides a look at the Excel 2008 improvements that cater to spreadsheet novices and experts alike with helpful new formula tools and a significantly increased grid workspace. Formula Builder: Another great tool to help all Excel users tap into the power of this application is Formula Builder. Found in the updated Excel 2008 Toolbox, Formula Builder walks users through the steps needed to create the perfect formula for any occasion. Formula AutoComplete: And for those who are a little further along on the Excel proficiency continuum, Formula AutoComplete is on the scene. Simply start by typing the first part of a formula in the Formula Bar, and a dynamic drop-down menu of functions and names appears -- with the most recent ones at the top. Select an item to insert from the list and let the computations begin. Increased Rows and Columns: As part of Mac BU's ongoing efforts to satisfy power users while enhancing the everyday user experience, Excel 2008 introduces increased rows and columns. This expansion matches the Windows Office System 2007, so all Excel spreadsheet users on Macs and PCs will have access to up to 16,000 columns and more than 1 million rows which is truly a "Big Grid"! Please let me know if you have any questions and to review the features above visit the Sneak Peek site.